For the anniversary of the sinking of the Titanic I’ve decided to post this extract from my book Lancashire: Who Lies Beneath? A violin is also carved into the gravestone and there is a page from Arthur Sullivan’s setting of the hymn Nearer My God To Thee, the hymn tune which was reputedly played by the band of which Wallace Hartley was the leader, as the ship sank. Whether that is true isn’t actually clear, but it was the bravery of Hartley and his musicians in continuing to play that night that went some way to preventing a mass panic and a stampede for the lifeboats which may have saved many lives. 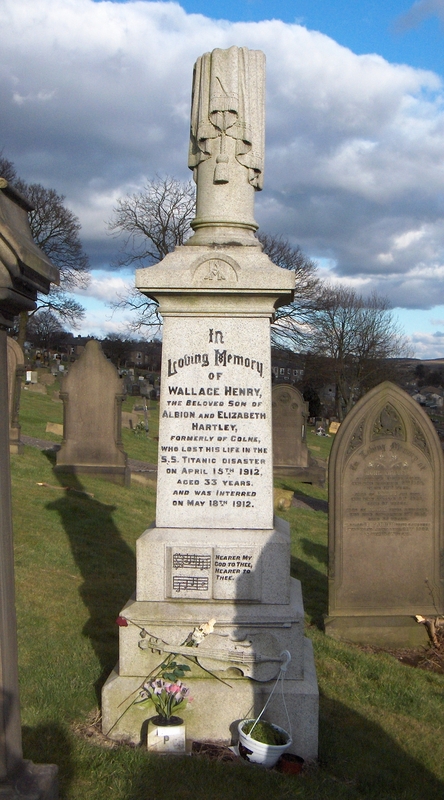 Wallace Henry Hartley was born on 2 June 1878 at 92 Greenfield Road in Colne. His parents, Albion and Elizabeth Hartley were textile workers and he had an elder sister Mary Ellen and a younger sister Lizzie. A younger brother died in infancy. He was a talented violinist and as he came from a musical family his father had always encouraged his talent. But when he left school Wallace Hartley went to work in a local bank, the Craven and Union, as a clerk and stayed there until he moved with the family to Huddersfield in 1895, where he joined the Huddersfield Philharmonic Orchestra as a violinist whilst continuing to work as a bank clerk during the day. It wasn’t until 1903 that he first played professionally when he moved to the seaside town of Bridlington where he played First Violin in the Bridlington Municipal Orchestra. In 1909 he began his career as a musician on board the Cunard liners that sailed between the UK and USA. He played on the Lucania, the Lusitania, playing the second violin in the ship’s five-man band, and in October 1910 he was promoted to bandmaster on the Mauretania, which was the best and fastest ship afloat at the time. When the new White Star Lines ship Titanic sailed from Southampton on 10 April 1912 Wallace Hartley was the bandmaster, although he had been reluctant to accept the job as he had just proposed to his fiancée, Maria Robinson, and was considering giving up working on the ships to be with her. But not only was this a promotion, it also meant a pay rise for the musician who was not highly paid and, hoping that the voyage would provide him with contacts for future work, he agreed to go. On 10 April 1912, Wallace Hartley and his band played on the upper deck of the ship as the First Class passengers embarked. The Titanic made good speed westwards across the Atlantic towards New York until there was a sighting of ice around noon on Sunday 14 April. Wallace Hartley, who had crossed the North Atlantic Ocean over eighty times, probably wasn’t unduly concerned, but shortly after midnight, it became clear that the ship was sinking and passengers were directed to the lifeboats. Wallace Hartley assembled all the musicians together to play in the First Class lounge and as people in life jackets waited to board lifeboats, the band continued to play as if nothing was amiss. When passengers were moved out onto the Boat Deck, Wallace Hartley and his musicians moved outside too, to continue playing and many people believe that their playing helped to keep passengers calm and allowed the lifeboats to be loaded in an orderly fashion. At 2.20 am on 15 April 1912 the Titanic sank and in the last wave to engulf the decks all eight bandsmen were swept into the icy waters and drowned. Two weeks later, Wallace Hartley’s body was found floating in the Atlantic Ocean by the cable ship Mackay-Bennett. First recorded as body number 224, his identity was soon apparent. He was still clothed in his bandsman’s uniform of brown overcoat, green facings, black boots and green socks. His music box was still strapped to his body and amongst the items found in his pockets was a gold fountain pen with his initials on – W.H.H. His body, perhaps ironically, packed in ice to preserve it, was returned to the UK aboard the SS Arabic and he was brought home to Colne to a hero’s welcome. Over forty thousand people lined the streets of the small town to pay their respects at his funeral on 18 May. The procession, led by seven bands, made its way to the Bethel Chapel, where Wallace had sung in the choir as a boy, and was almost half a mile long. The congregation for the service totalled over a thousand, in a building designed only to hold seven hundred. As he was buried an orchestra played Nearer My God To Thee. My grandfather, who used to live in Colne, was one of the 40,000 who lined the streets. He also had a copy of the sheet music of ‘Nearer My God to Thee’ with the pictures of all the band on the front. I remember seeing it in the piano stool, but I don’t know what happened to it. And evidently my great-grandfather’s brother married a cousin of Wallace Hartley – that’s my closest link to the Titanic, as far as I know!